I am new to using CURA from Simplify3D. I want to print 4 of these dogbones from PP and 4 from PC. I am testing the adhesion strength between 2 shell layers. Therefore, I want to print the top and bottom at 100% infill (which will be attached to the tensile test grips) and keep the middle section hollow (0% infill) with 2 shells. 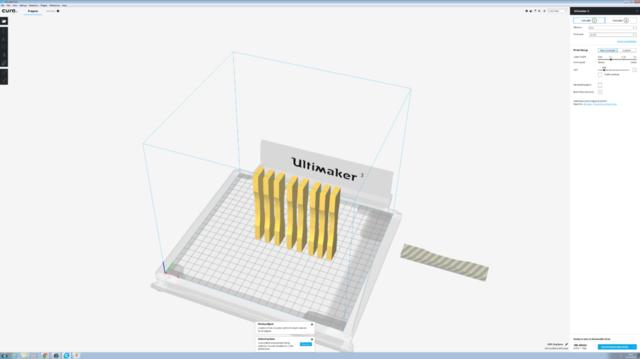 I have attached the CURA file. I'm dissapointed no one helped you on this. If you google around there are instructions on how to do what you want. You can do exactly what you want. I'd set the infill to 100% and then load a cube into cura and make sure you set the cura preferences (not model settings) such that you can have parts overlap the same volume. Then you can stretch and zoom that cube until it encopasses the volume where your dogbones are skinnier. You also have to disable forceing Z=0 all the time - also in cura settings (not model settings). And you can increase Z so your cuboid is now above the build plate. then there is a trick to tell cura to do different infill settings inside that cuboid. I forget where this feature is - I think you select the cuboid and either right click on it or maybe it's something along the left edge of the screen. I've seen a youtube video I think from didierkl aka didier klein maybe - also explaining this feature. Anyway the last step is to tell cura that the infill should be 0% inside that cuboid. Just an idea: Top/Bottom thickness 20mm, zero infill, 2 perimeters? Check the preview. cura preferences (not model settings) such that you can have parts overlap the same volume. I have found the "Union overlapping volumes" in the settings and clicked it. When I put the cube around the skinny bit, it pushes the dogbones off the bed. What other setting do I need to tick? In cura settings (not profile settings) there is a checkbox to keep your cube from moving everything else away. "allow overlapping volumes" or something like that. sorry too lazy to check right now. dxp actually has a great idea - just set top and bottom thickness to the length of your ends. It's called "ensure models are kept apart". Uncheck that.